Each Site is operated by Food Truck Properties, LLC. Unless otherwise specified, the entity controlling the Site you are accessing is referred to herein as "FTP," "we," "us" or "our". You should read through all the Terms carefully. The Terms constitute a legally binding agreement between you and FTP. You are not authorized to use this Site unless you are at least 18 and able to enter into legally binding contracts. We do not knowingly collect the information of anyone under the age of 18. 1. The Site is a Venue and We are Not a Party to any Rental or Sales Agreement or other Transaction Between Users of the Site. We urge all users to be responsible about their use of this Site and any transaction entered into as a result of either listing a vehicle or renting a vehicle. FoodTruckRental.com and other Sites act as a venue to allow vehicle owners and vehicle managers who advertise on the Site (each, a "member") to offer for rent in any pricing format of their choosing, a specific vehicle(s) to potential renters (each, a "renter" and, collectively with a member, the "users"). Even if the Site allows you to offer or book a rental on the Site, we are not a party to any rental or other agreement between users. As a result, any part of an actual or potential transaction between a renter and a member, including the quality, condition, safety or legality of the vehicle advertised, the truth or accuracy of the listings (including the content thereof or any vehicle or review thereof), the ability of members to rent a vehicle or the ability of renters to pay for vehicles are solely the responsibility of each user. 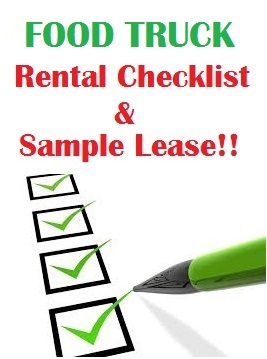 You acknowledge and agree that you may be required to enter into a separate agreement and/or waiver prior to making a rental or purchasing a product or service and we may place additional restrictions on your booking, product or service. Members further agree that they are responsible for and agree to abide by all laws, rules and regulations applicable to the advertisement of their vehicle(s) and the conduct of their rental business, including but not limited to taxes, permit or license requirements, zoning ordinances, safety and health compliance, and compliance with all anti-discrimination laws, as applicable. Please be aware that, even though we are not a party to any rental transaction and assume no liability for legal compliance pertaining to vehicles listed on the Site, there may be circumstances where we are nevertheless legally obligated (as we may determine in our sole discretion) to provide information relating to your listing in order to comply with governmental bodies in relation to investigations, litigation or administrative proceedings, and we may choose to comply with or disregard such obligation in our sole discretion. Users are granted a limited, revocable, non-exclusive license to access the Site and the content and services provided on the Site solely for the purpose of advertising vehicle(s), searching for vehicle(s), purchasing or researching (for the purpose of inquiring about purchasing) any of the products or services offered on any Site, participating in an interactive area hosted on any Site or for any other purpose clearly stated on a Site, all in accordance with the Terms. Any use of the Site that is not for one of these purposes or otherwise in accordance with the Terms or as otherwise authorized by us in writing is expressly prohibited. The license to use the Site only extends to the uses expressly described herein. The license to use the site granted to users in these Terms does not include any right of collection, aggregation, copying, scraping, duplication, display or derivative use of the Site nor any right of use of data mining, robots, spiders or similar data gathering and extraction tools without our prior written permission; provided, however, that a limited exception from the foregoing exclusion is provided to general purpose internet search engines that use tools to gather information for the sole purpose of displaying hyperlinks to the Site, provided they each do so from a stable IP address or range of IP addresses using an easily identifiable agent and comply with our robots.txt file. "General purpose internet search engines" do not include a website or search engine or other service that provides classified listings or vehicle rental advertisements, or any subset of the same or which is in the business of providing vehicle rental services or other services that compete with us. Any commercial use (other than by members with a fully paid up subscription in good standing (a "valid subscription") or by members pursuant to a valid license to software offered on a Site (a "valid license")) of the Site or any content on the Site. User verification on the Internet is difficult and we cannot, and do not, assume any responsibility for the confirmation of each user's purported identity. We encourage you to communicate directly with a renter or member through the tools available on the Site though even this does not assure you of the identity of the person with which you are communicating. EACH USER ACKNOWLEDGES AND AGREES THAT: (1) NEITHER FTP NOR ANY OF ITS AFFILIATES WILL HAVE ANY LIABILITY TO ANY USER FOR ANY UNAUTHORIZED TRANSACTION MADE USING ANY USER’S PASSWORD; AND (2) THE UNAUTHORIZED USE OF YOUR ONLINE ID AND PASSWORD FOR YOUR FTP ACCOUNT OR YOUR EMAIL ACCOUNT COULD CAUSE YOU TO INCUR LIABILITY TO BOTH FTP AND OTHER USERS. Further, we may, without notice to you, suspend or cancel your listing at any time even without receiving notice from you if we suspect, in our sole discretion, that your account with us or your email account is being used in an unauthorized or fraudulent manner. You agree that, with respect to other users' personal information that you obtain directly or indirectly from or through the Site or through any Site-related communication, transaction or software, we have granted to you a license to use such information only for: (a) Site-related communications that are not unsolicited commercial messages, (b) using services offered through the Site, and (c) inquiring about or otherwise facilitating a financial transaction between you and the other user related to the purpose of the Site (such as inquiring about or booking an on-line booking or charging a personal credit card) Any other purpose will require express permission from the user. You may not use any such information for any unlawful purpose or with any unlawful intent. We do not tolerate spam or unsolicited commercial electronic communications of any kind. Therefore, without limiting the foregoing, you are not licensed to add a Site user, even a user who has rented a vehicle(s) from you or to you, to your mailing list (email or physical mail) without the user's express consent. You may not use any tool or service on the Site to send spam or unsolicited commercial electronic communications of any kind or in any other way that would violate these Terms. You are responsible for all content you provide to the Site or through any tool or service provided on the Site. We have no duty to pre-screen content posted on the Site by members, renters or other users, whether directly contributed by the user or contributed by us or a third party on behalf of the user (including, without limitation, property listings, reviews of a vehicle(s), participation in an interactive community, forum or blog (each an "Interactive Forum") or any other content provided by a user to the Site), (collectively, "user contributed content"). We are not responsible for user contributed content. "User contributed content" also includes information that a user provided to a third party website which is then provided to our Site by a tool we offer. We reserve the right to decline to permit the posting on the Site of, or to remove from the Site, any user contributed content that fails to meet our Content Guidelines , any other guidelines posted on a Site or if it otherwise violates these Terms, each as determined in our discretion. We may also remove user contributed content if it is brought to our attention, such as by notice given to us by a user or any third party that any part of these Terms, or any other requirements governing the posting of such content, has/have been apparently breached in respect of such content, as determined in our consent. Finally, we reserve the right (but do not assume the obligation) to edit a member’s content or user contributed content in a non-substantive manner solely to cause the content to comply with our content guidelines or formatting requirements. Vehicle Listings: All vehicle listings on the Site are the sole responsibility of the member (who may be the owner, duly authorized manager, or agent of the owner) and we specifically disclaim any and all liability arising from the alleged accuracy of the listings, vehicle reviews, guest book entries, or any alleged breaches of contract on a member's part. Members are solely responsible for keeping their vehicle information up-to-date on the Site, including, but not limited to any and all representations about any vehicle, its specifications, condition, location, price, and availability. We do not represent or warrant that any of the copy, content, vehicle reviews, guest book entries, vehicle location, suitability, pricing or availability information published on the Site is accurate or up-to-date even in the case where prospective renters have searched for specific special offers, dates, or types of vehicles. We may from time to time provide or facilitate services to Members to create or improve the quality of their vehicle listings. However, we assume no responsibility to verify vehicle listings. Members are solely responsible for ensuring the accuracy of any vehicle descriptions, and renters are solely responsible for verifying the accuracy of such descriptions. License and Rights Granted to Us: By submitting or authorizing user contributed content, you grant to us and our affiliates a perpetual, worldwide, irrevocable, unrestricted, non-exclusive, royalty-free and fully paid-up license to use, copy, license, sublicense (through multiple tiers), adapt, distribute, display, publicly perform, reproduce, transmit, modify, edit and otherwise exploit the copy, the photographs and the likenesses (if any) of any of your user contributed content, in connection with our business or the business of our affiliates. Notwithstanding the foregoing, following the termination or expiration of a vehicle listing subscription, we may continue to display the user contributed content that was displayed in such listing. You agree that we may sublicense all the rights granted to us under these Terms to one or more third parties we may contract with to display all or part of the member’s vehicle listing or otherwise provide promotional or other services related to our business. If any user contributed content created by members or users is translated for display on any Site or any site of any affiliate of FTP, the member or user is solely responsible for the review and accuracy of such translation. Unless we specify otherwise to the user or member, any translation services are offered by us free of charge. Maps provided on the Site that are provided by Google are subject to the Google Maps terms and conditions located at:http://www.google.com/intl/en_us/help/terms_maps.html . We respect the intellectual property rights of others, and FTP does not permit, condone, or tolerate the posting of any content on the Site that infringes any person's copyright. FTP will terminate, in appropriate circumstances, a member or renter who is the source of repeat infringements of copyright. Should you become aware of or suspect any copyright infringement on this Site, please refer to our procedures for Notification of Copyright Infringement . Unsolicited Ideas: From time to time, users submit to us ideas or suggestions pertaining to our business, such as ideas for new or improved products or technologies, website or tool enhancements, processes, materials, marketing plans or new product names. We are under no obligation to review or consider them. If you choose to submit any ideas, original creative artwork, suggestions or other works ("submissions") in any form to us, then regardless of what you say, write or provide to us in connection with your submissions, the following terms shall apply. The sole purpose of this policy is to avoid potential misunderstandings or disputes in the event that any part of our business, such as our products, websites, technologies or marketing strategies, seem similar to any of your submissions. If you provide any submissions to us, you agree that: (1) your submission and its contents will automatically become the property of FTP, without any compensation to you; (2) FTP may use or redistribute any such submission and its contents for any purpose and in any way; (3) there is no obligation for FTP to review any submission; and (4) there is no obligation to keep any submission confidential. Feedback on our Business: We welcome your feedback regarding many areas of our business. If you want to send us your feedback, we simply request that you send it to us using the links under "General - Contact Us" below or you can choose from the many other listed areas for your feedback. Please provide only specific feedback on our websites and services. Keep in mind that we assume no obligation to keep any feedback you provide confidential and we reserve the right to use or disclose such information in any manner. To provide feedback, you can contact us as provided under "Contact Us" below. The Site is controlled and operated by FTP or an affiliate of FTP in the United States. Software available on the Site (the "Software") is subject to United States export controls. No Software available on the Site or software available any other site operated by FTP or an affiliate of FTP in the United States may be downloaded or otherwise exported or re-exported (a) into (or to a resident of) Cuba, Iraq, Libya, North Korea, Iran, Syria or any other country to which the United States has embargoed goods, or (b) anyone on the United States Treasury Department’s list of Specially Designated Nationals or the United States Commerce Department’s Table of Deny Orders. By using the Site, you represent and warrant that you are not located in, under the control of, or a national or resident of any such country or on any such list. All Software is the copyrighted work of FTP, an affiliate of FTP or an identified third party. Your use of such Software is governed by these Terms and the terms of any additional license agreement that accompanies or is included with such Software. If the Software is not accompanied by an additional license agreement, we hereby grant you a limited, personal, nontransferable license to use the Software for viewing and using this Site in accordance with these Terms and for no other purpose. IN NO EVENT WILL FTP, SUBSIDIARIES, AFFILIATES, OFFICERS, DIRECTORS, CONSULTANTS, AGENTS AND/OR EMPLOYEES (COLLECTIVELY, THE "FTP GROUP"), OR ANY THIRD PARTY PROVIDER OF A SERVICE OR TOOL OFFERED ON ANY SITE OF A MEMBER OF THE FTP GROUP (EACH A "THIRD PARTY PROVIDER"), BE LIABLE FOR ANY LOST PROFITS OR ANY INDIRECT, CONSEQUENTIAL, SPECIAL, INCIDENTAL, OR PUNITIVE DAMAGES ARISING OUT OF, BASED ON, OR RESULTING FROM (A) OUR SITE, (B) THESE TERMS, (C) ANY BREACH OF THESE TERMS BY YOU OR A THIRD PARTY, (D) USE OF THE SITE, TOOLS OR SERVICES WE PROVIDE RELATED TO THE BUSINESS WE OPERATE ON THE SITE BY YOU OR ANY THIRD PARTY (E) ANY USER CONTRIBUTED CONTENT, (F) INTERACTION BETWEEN OUR SITE AND ANY THIRD PARTY SITE, INCLUDING WITHOUT LIMITATION A SOCIAL MEDIA SITE, FACILITATED BY A TOOL OR SERVICE ON OUR SITE AND/OR (G) ANY ACTUAL OR ATTEMPTED COMMUNICATION OR TRANSACTION BETWEEN USERS, IN EACH CASE, EVEN IF WE HAVE BEEN ADVISED OF THE POSSIBILITY OF SUCH DAMAGES. THESE LIMITATIONS AND EXCLUSIONS APPLY WITHOUT REGARD TO WHETHER THE DAMAGES ARISE FROM (1) BREACH OF CONTRACT, (2) BREACH OF WARRANTY, (3) STRICT LIABILITY, (4) TORT, (5) NEGLIGENCE, OR (6) ANY OTHER CAUSE OF ACTION, TO THE MAXIMUM EXTENT SUC H EXCLUSION AND LIMITATIONS ARE NOT PROHIBITED BY APPLICABLE LAW. IF YOU ARE DISSATISFIED WITH THE SITE, YOU DO NOT AGREE WITH ANY PART OF THE TERMS, OR HAVE ANY OTHER DISPUTE OR CLAIM WITH OR AGAINST US OR ANOTHER USER OF THE SITE WITH RESPECT TO THESE TERMS OR THE SITE, THEN YOUR SOLE AND EXCLUSIVE REMEDY AGAINST US IS TO DISCONTINUE USING THE SITE. IN ALL EVENTS, OUR LIABILITY, AND THE LIABILITY OF ANY MEMBER OF THE FTP GROUP, TO YOU OR ANY THIRD PARTY IN ANY CIRCUMSTANCE ARISING OUT OF OR IN CONNECTION WITH THE SITE IS LIMITED TO THE GREATER OF (A) THE AMOUNT OF FEES YOU PAY TO US IN THE TWELVE MONTHS PRIOR TO THE ACTION GIVING RISE TO LIABILITY OR (B) $200.00 IN THE AGGREGATE FOR ALL CLAIMS. YOU ACKNOWLEDGE AND AGREE THAT ANY TRANSMISSION TO AND FROM THIS SITE IS NOT CONFIDENTIAL AND YOUR COMMUNICATIONS OR USER CONTRIBUTED CONTENT MAY BE READ OR INTERCEPTED BY OTHERS. YOU FURTHER ACKNOWLEDGE AND AGREE THAT BY SUBMITTING COMMUNICATIONS OR USER CONTRIBUTED CONTENT TO US AND BY POSTING INFORMATION ON THE SITE, INCLUDING VEHICLE LISTINGS, NO CONFIDENTIAL, FIDUCIARY, CONTRACTUALLY IMPLIED OR OTHER RELATIONSHIP IS CREATED BETWEEN YOU AND US OTHER THAN PURSUANT TO THESE TERMS. YOU ACKNOWLEDGE AND AGREE THAT YOU WILL NOT HOLD OR SEEK TO HOLD US OR ANY THIRD PARTY PROVIDER RESPONSIBLE FOR THE CONTENT PROVIDED BY ANY USER, INCLUDING, WITHOUT LIMITATION, ANY TRANSLATION THEREOF, AND YOU FURTHER ACKNOWLEDGE AND AGREE THAT WE ARE NOT A PARTY TO ANY RENTAL TRANSACTION OR OTHER TRANSACTION BETWEEN USERS OF THE SITE. WE HAVE NO CONTROL OVER AND DO NOT GUARANTEE (OTHER THAN PURSUANT TO ANY GUARANTEE THE MAY BE OFFERED ON THE SITE) THE SAFETY OF ANY TRANSACTION, VEHICLE(S) OR THE TRUTH OR ACCURACY OF ANY LISTING OR OTHER CONTENT PROVIDED ON THE SITE. YOU FURTHER ACKNOWLEDGE THAT BY DISPLAYING INFORMATION OR PROPERTY LISTINGS IN PARTICULAR DESTINATIONS, WE DO NOT REPRESENT OR WARRANT THAT USE OF A VEHICLE(S) IS WITHOUT RISK AND ARE NOT LIABLE FOR DAMAGES WITH RESPECT TO ANY USE OF A VEHICLE(S). IN THE EVENT THAT YOU HAVE A DISPUTE WITH ONE OR MORE OTHER USERS OF THE SITE (INCLUDING, WITHOUT LIMITATION, ANY DISPUTE BETWEEN USERS REGARDING ANY TRANSACTION OR USER CONTRIBUTED CONTENT) OR ANY THIRD PARTY WEBSITE THAT MAY BE LINKED TO OR FROM OR OTHERWISE INTERACT WITH THE SITE, INCLUDING WITHOUT LIMITATION ANY SOCIAL MEDIA SITE, YOU HEREBY AGREE TO RELEASE, REMISE AND FOREVER DISCHARGE EACH MEMBER OF THE FTP GROUP, EACH OF THEIR RESPECTIVE AGENTS, DIRECTORS, OFFICERS, EMPLOYEES, AND ALL OTHER RELATED PERSONS OR ENTITIES FROM ANY AND ALL MANNER OF RIGHTS, CLAIMS, COMPLAINTS, DEMANDS, CAUSES OF ACTION, PROCEEDINGS, LIABLITIES, OBLIGATIONS, LEGAL FEES, COSTS, AND DISBURSEMENTS OF ANY NATURE WHATSOEVER, WHETHER KNOWN OR UNKNOWN, WHICH NOW OR HEREAFTER ARISE FROM, RELATE TO, OR ARE CONNECTED WITH SUCH DISPUTE AND/OR YOUR USE OF THE SITE. IF YOU ARE A CALIFORNIA RESIDENT, YOU WAIVE CALIFORNIA CIVIL CODE SECTION 1542, WHICH SAYS: "A GENERAL RELEASE DOES NOT EXTEND TO CLAIMS WHICH THE CREDITOR DOES NOT KNOW OR SUSPECT TO EXIST IN HIS FAVOR AT THE TIME OF EXECUTING THE RELEASE, WHICH, IF KNOWN BY HIM MUST HAVE MATERIALLY AFFECTED HI S SETTLEMENT WITH THE DEBTOR." YOU HEREBY AGREE TO INDEMNIFY, DEFEND AND HOLD EACH MEMBER OF THE FTP GROUP (COLLECTIVELY, THE "INDEMNIFIED PARTIES") HARMLESS FROM AND AGAINST ANY AND ALL LIABILITY AND COSTS INCURRED BY THE INDEMNIFIED PARTIES IN CONNECTION WITH ANY CLAIM ARISING OUT OF YOUR USE OF THE SITE OR OTHERWISE RELATING TO THE BUSINESS WE CONDUCT ON THE SITE (INCLUDING, WITHOUT LIMITATION, ANY POTENTIAL OR ACTUAL COMMUNICATION, TRANSACTION OR DISPUTE BETWEEN YOU AND ANY OTHER USER OR THIRD PARTY), ANY CONTENT POSTED BY YOU OR ON YOUR BEHALF OR POSTED BY OTHER USERS OF YOUR ACCOUNT TO THE SITE, ANY USE OF ANY TOOL OR SERVICE PROVIDED BY A THIRD PARTY PROVIDER, ANY USE OF A TOOL OR SERVICE OFFERED BY US THAT INTERACTS WITH A THIRD PARTY WEBSITE, INCLUDING WITHTOUT LIMITATION ANY SOCIAL MEDIA SITE OR ANY BREACH BY YOU OF THESE TERMS OR THE REPRESENTATIONS, WARRANTIES AND COVENANTS MADE BY YOU HEREIN, INCLUDING WITHOUT LIMITATION, ATTORNEYS' FEES AND COSTS. YOU SHALL COOPERATE AS FULLY AS REASONABLY REQUIRED IN THE DEFENSE OF ANY CLAIM. WE RESERVE THE RIGHT, AT OUR OWN EXPENSE, TO ASSUME THE EXCLUSIVE DEFENSE AND CONTROL OF ANY MATTER OTHERWISE SUBJECT TO INDEMNIFICATION BY YOU AND YOU SHALL NOT IN ANY EVENT SETTLE ANY MATTER WITHOUT OUR WRITTEN CONSENT. ANY AND ALL SERVICES AND RIGHTS OF USE HEREUNDER ARE PERFORMED, PERFORMABLE AND/OR SOLD IN THE STATE OF CALIFORNIA, UNITED STATES OF AMERICA, AND YOU IRREVOCABLY AGREE AND CONSENT THAT ANY CAUSE OF ACTION YOU MAY SUBMIT IN CONNECTION WITH YOUR USE OF THE SITE OR PURSUANT TO THESE TERMS WILL BE FILED IN THE STATE OR FEDERAL COURTS IN LOS ANGELES COUNTY, CALIFORNIA WHICH YOU ACKNOWLEDGE, CONSENT TO AND AGREE WILL BE THE EXCLUSIVE FORUM AND VENUE FOR ANY LEGAL DISPUTE BETWEEN YOU AND US. YOU ALSO AGREE THAT ANY DISPUTE BETWEEN YOU AND US WILL BE GOVERNED BY THE LAWS OF THE STATE OF CALIFORNIA, WITHOUT REGARD TO CONFLICT OF LAWS PRINCIPLES. ANY CAUSE OF ACTION YOU MAY HAVE HEREUNDER OR WITH RESPECT TO YOUR USE OF THE SITE MUST BE COMMENCED BY FILING SUIT IN LOS ANGELES COUNTY, CALIFORNIA, WITHIN ONE (1) YEAR AFTER THE INCIDENT UPON WHICH THE CLAIM OR CAUSE OF ACTION IS BASED FIRST OCCURRED. Contact Us: To contact us for any reason, users can email us at info@foodtruckrental.com. Food Truck Properties, LLC, Attn: Legal Department, 924 W. Washington Blvd., Los Angeles, CA 90015. This version of the Terms became effective on the date set forth above and this version amends the version effective prior to such date. We reserve the right, in our sole discretion, to amend these Terms, in whole or in part, at any time, with or without your consent, and you acknowledge and agree that your consent to any such amendment is not required in the event the proposed amendment is clerical and/or non-substantive in nature. Notification of any amendment will be posted on the Site by the indication of the last amendment date at the top of these Terms and will be effective immediately. If you disagree with any non-clerical and/or substantive amendment to these Terms, then (i) your sole remedy as a renter, or any other user other than a member, is to discontinue your use of the Site, and (ii) your sole remedy as a member is to withhold your consent to the applicability of the proposed amendment to your use of the Site, in which case your use of the Site will continue to be governed by the terms and conditions that were applicable to your use of the Site during the then current term of your subscription as the same were in effect immediately prior to the proposed amendment and you agree that you are responsible for keeping a copy of such terms. When members renew subscriptions, the terms in effect at the time of renewal will govern, provided that such terms may change as described above. Our services may only be used by members who can form legally binding contracts under applicable law. If you are registering as a business entity, you represent that you have the authority to bind the entity to these Terms. Each member represents and covenants that all information submitted to us and to the Site during such member’s registration with the Site shall be true and correct. Each member further agrees to promptly provide notice to the Site by contacting us as provided above under "General - Contact Us" regarding any updates to any such contact information previously submitted by such member to the Site. Each member agrees to promptly provide such proof of personal identification, proof of ownership of the property listed on the Site, and proof of authority to list the vehicle as we may request. Each member further represents and covenants that: (i) it owns and/or has all necessary rights and authority to offer for rent and to rent the vehicle(s) listed by such member; (ii) it will not wrongfully withhold a rental deposit in breach of the underlying rental agreement; (iii) that it will accurately describe the subject vehicle(s) and will not fail to disclose a material defect in, or material information about, a vehicle(s); (iv) that it will not wrongfully deny access to the listed vehicle; and (v) that it will not fail to provide a refund when due in accordance with the underlying rental agreement. Upon our request, each member agrees to promptly provide to us such proof of personal identification, proof that the condition, location, or specifications associated with the vehicle are accurately described in the listing, proof of ownership of the vehicle listed on the Site, and/or proof of authority to list the vehicle as we may request. All content and copy edits submitted by members are subject to review and approval by us in our sole discretion. We reserve the right to refuse to publish any content that we determine, in our sole discretion, does not meet these Terms or is otherwise unacceptable to us. However, we assume no duty to review content and we shall not have any liability for any loss or damage resulting from the design or positioning of the copy, properties, content and/or photographs or any change made to any content, photograph or copy submitted by any member. All content must meet these Terms and our Content Guidelines . We reserve the right to edit content submitted to the Site in a non-substantive manner solely to cause the content to comply with our content guidelines or formatting requirements. Members are responsible for reviewing and ensuring that any content displayed on the Site appears as the member intended. Photographs should depict the vehicle as the main subject of the photograph and may not include children or adults if you do not have their legal consent or any information that would violate the privacy rights, intellectual property rights or any other rights of a third party. Photographs must meet our Content Guidelines. We reserve the right not to display or to remove any photographs that we determine, in our sole discretion, do not meet these Terms or are otherwise unacceptable to us. By submitting a photograph either electronically through the Site or by mailing a paper photograph to our offices, the member represents and warrants that (a) (i) it holds all intellectual property rights with respect to each submitted photograph, or (ii) it has secured from the copyright holder all rights necessary for the photograph to be used in an online advertisement, (b) that any people in the photograph have given permission for their likeness to be displayed in an online advertisement on the Site, (c) that the photograph accurately and fairly represents the subject of the photograph and has not been altered in any manner that would mislead a viewer of that photograph, and (d) that it will indemnify and hold harmless the Site and any member of the FTP Group from any cause of action arising from any misrepresentation with respect to any and all photographs so submitted. There are limited ways in which you may use our trademarks or logos without specific prior written authorization. The following are general guidelines: It is usually permissible for you to refer to FTP or the name of one of our affiliate websites on which you list your vehicle(s) in a descriptive manner in your listing on the Site or in other permissible communications. For example, you might say "Check out my food truck on FTP," or "I list food trucks on FTP." However, you may not refer to FTP or any of our affiliates in any way that might lead someone to believe that your company or site is sponsored by, affiliated with, or endorsed by FTP or one of our affiliates. For example, you may not say "FTP sponsors my food truck rental," or describe your property as "FTP’s best food truck rental." You may not use the FTP name or one of our affiliates’ names on any other website that lists vehicle rentals without our prior written authorization. The FTP name and logo and those of the FTP Group and our affiliates are registered trademarks in the United States and other jurisdictions around the world. We generally do not permit the use of our names and logos, other than as described above or with our prior written authorization. If you want permission to use our name and/or logo in any other manner, including, without limitation, on any website, business card, signage, t-shirts, etc., or if you have other questions, you may email us at info@foodtruckrental.com. 26. Substitution of Vehicles; Advertising More Than One Vehicle; Vehicle Managers. Each advertisement must relate to an individual and uniquely identified vehicle. The vehicle in an advertisement may not be substituted for another vehicle without our consent. We may approve a request if the vehicle that was listed was sold or the contract with the owner was cancelled and the member provides sufficient proof thereof and completes any additional request forms we may request. The term of the subscription for any substituted vehicle shall be the same as the term of the originally listed property (i.e., the term will not be extended past the original term). If a member submits changes to an existing listing that, if approved, would substantially alter the listing to make it that of another vehicle, then we have the right to terminate the listing and may choose, in our sole discretion, to retain any fees associated with the term of the previously existing listing as compensation for the violation of this condition. The listing specifically cannot be a mere example of vehicles in a given area. Only one vehicle can appear on each advertisement. We reserve the right to amend the copy or remove any advertisement when more than one vehicle is described in such advertisement, and may choose, in our sole discretion to retain any fees associated with the initial term of such non-conforming listing as compensation for the violation of this condition. Members who own or manage twenty or more vehicles should contact FTP to discuss the packages that may best suit their needs. All other subscription listing packages require one subscription per listing (one subscription per vehicle). Contact FTP for additional information. Payments between members and renters: We are not a party to any payment transaction between members and renters. No member may request any renter to mail cash, or utilize any instant-cash wire transfer service such as Western Union or MoneyGram in payment for all or part of a vehicle rental transaction. Any violation of this term or any other unacceptable payment methods that may be posted on the Site may result in the immediate removal of the non-conforming listing from the Site without notice to the member and without refund. From time to time, we may become aware of users attempting to conduct a transaction that would involve an unauthorized payment method or a fraudulent payment method. Ideally, we hope to be able to assist users in avoiding such transactions, but we assume no liability or responsibility to do so or to inform users of any such actual or suspected activity. Our Right to Terminate a Listing: If, in our sole discretion, any member submits unsuitable material to our Site or into our database, misuses the Site or our online system or is in material breach of these Terms, we reserve the right to terminate such member’s subscription(s) immediately. In addition, if we become aware of or receive a complaint or a series of complaints from any user or other third party regarding a member’s listing or rental practices that, in our sole discretion, warrants the immediate removal of such member’s listing from the Site (for example, and without limitation, if a member double-books a vehicle for multiple renters on the same date, or engages in any practice that, in our sole discretion, would be considered unfair or improper within the vehicle rental industry, or if we receive a complaint that any listing’s content infringes on the rights of a third party), then we may immediately terminate such member’s subscription(s) without notice to the member and without refund. We assume no duty to investigate complaints. Finally, if any member is abusive or offensive to any employee or representative of the FTP Group, we reserve the right to terminate such member’s subscription(s) immediately. Finally, if any member is in breach of these Terms or its obligations to us then we may terminate such member’s subscription(s) immediately without notice to the member. Transfer of Listing: No listing may be transferred to another party.